"It rips, and cuts, it makes a horrible racket--a chainsaw is a frightening thing. I write not to glorify its terrible power but to acknowledge its place in the most sweeping revolution that technology has wrought in the 20th century--the revolution of individual empowerment." 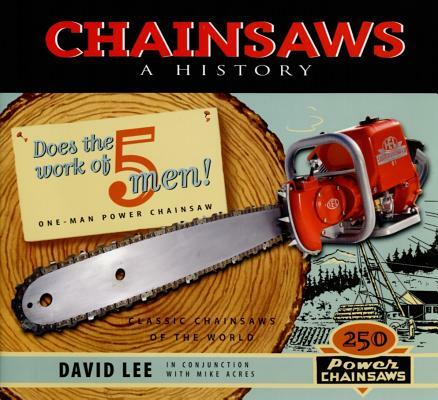 So begins author David Lee in this first-ever book on the worldwide history of the chainsaw, an invention that transformed the forest industry and eventually became the indispensable companion of every red-blooded country dweller. Chainsaws, it turns out, have a curious history and since the 19th century they have taken on many forms. From 600-pound steam-powered behemoths to gas chainsaws mounted on wheeled carriages to diesel chainsaws and electric chainsaws with portable generators, this book musters a curious collection of contraptions and inventors the like of which we haven't seen since Those Magnificent Men in Their Flying Machines. Carefully tracing the evolutionary threads of countless short-lived pioneer devices, author Lee, working together with a worldwide network of chainsaw buffs, traces the roaring, woodchip-and-oil-sprayed progress of what is now a lightweight modern machine that holds a place of honour in the world's woodsheds. Chainsaws is a handsome gift book full of wonderful old and new photos along with priceless chainsaw ephemera that will warm the heart of anyone who's ever held a power tool. From Andreas Stihl's Black Forest experiments to Vancouver's booming WWII chainsaw industry, to the postwar race to develop one-man saws, the rise and fall of Canada's proud Pioneer brand, and the late entry into the field of the centuries-old arms manufacturer Husqvarna,it examines why the chainsaw is no good for massacres (in Texas or elsewhere), and why it is unlikely to replaced by any new high-tech inventions such as lasers. on Southern Vancouver Island and now lives in Hamilton, Ontario, where he no longer heats with wood, but still misses the thrill of a saw in his hands.